Should the Mets trade R.A. Dickey this offseason? Sacrilege, I know. And beyond the fact that Dickey, as an extraordinary knuckleballer, a diligent worker, a passionate Star Wars fan, a contemplative writer and reader, a dedicated beard man, a distinguishing sandwich eater, an aesthetic revelation and an alley-oop pass for double-entendrists, seems perfectly tailored — almost fictionally crafted — to appeal to the geeky subset of Mets fans that includes this site’s author, every speculative offseason trade needs a willing partner. So the answer to any suggestive and somewhat sensationalized question like the one in the headline above is always that it depends on the deal. Plus, the Mets still have more than a month’s worth of baseball to play before anyone needs to worry about this in earnest. Consider the following blog post merely a thought experiment. First, let’s consider why the Mets might, ahem, dangle Dickey this winter. Since emerging in 2010, Dickey has pitched like an ace — if not quite in the Verlander/King Felix/Clayton Kershaw stratosphere, than certainly a No. 1 starter on most big-league teams, with a stellar 127 ERA+ over the stretch and the durability to pitch deep into games and amass innings. The Mets have a $5 million option on Dickey’s contract for next season, but by Fangraphs‘ math (which probably undervalues Dickey a little) his performance to date in 2012 should be worth over $18 million on the open market. Put simply, there is no team in baseball that would not stand to benefit by adding Dickey and likely no team that could not afford him. The Mets, meanwhile, do not appear primed to contend in 2013 as currently constructed, mostly because they do not now have anyone on their roster who looks likely to be an everyday outfielder next season and they will be weighed down by a couple of albatross contracts that don’t come off the books until 2014. Regardless, they could try to give Dickey a contract extension this offseason. Though Dickey will turn 38 in October, he has only improved across his tenure with the Mets as he has honed his signature pitch. And as my friend Mike Salfino has shown, historically, knuckleballers can succeed well into their 40s. But then there’s really not much precedent for knuckleballers like Dickey, who top out in the low 80s and strike out a batter an inning. And even if Dickey’s arm can shoulder that burden for years, a contract extension means the rest of his body will still need to handle the rigors of Major League play into his 40s. So given the inherent risks, it’s reasonable to at least wonder if the Mets would be best served dispatching Dickey elsewhere to tool up for 2014 and beyond, especially since starting pitching suddenly appears to be one area where the Mets have some relative amount of organizational depth. Herein lies the rub: Based on recent history, trading an ace pitcher for prospects to replenish the farm system almost never pays dividends so soon and doesn’t always pay dividends at all. Check it out. Based on quick and not at all exhaustive research, I can come up with four times in the past five years that an ace or near-ace pitcher has been traded with one full year of team control remaining on his contract. “Ace,” obviously, is an utterly arbitrary label, so if you’ve got more examples feel free to chime in. Johan Santana: The Mets, you probably recall, traded Carlos Gomez, Kevin Mulvey, Phil Humber and Deolis Guerra for Santana. Santana had one year remaining on his contract with the Twins at the time but a negotiating window was included in the trade and the deal was contingent upon an extension, so it’s not a perfect comparison. Still, the Twins’ haul was not great. Gomez played good defense in Minnesota for a couple of years but couldn’t hit at all and was finally traded for J.J. Hardy before the 2010 season. Humber and Mulvey both made a few underwhelming appearances before Humber was released and Mulvey sent to the Diamondbacks as a player to be named later in a deal for Jon Rauch. Guerra is still in the Minors. Even crediting the Twins for Hardy and Rauch andnot docking them for woeful reliever Jim Hoey — for whom Hardy was traded — the entire Santana package was worth 4.7 bb-WAR to the Twins — more than two wins less than Santana’s 2008 season alone. Roy Halladay: Halladay’s trade from the Blue Jays to the Phillies before the 2010 season also came concurrently with a contract extension. For the Doc’s services, the Phillies sent prized prospects Kyle Drabek, Michael Taylor and Travis d’Arnaud north. All three were on Baseball America‘s top 100 prospects list before the 2010 season, with Drabek and Taylor in the top 30. Drabek made a marginally successful three-start Major League debut later that year but hasn’t done much to speak of since, yielding a 5.34 ERA and an awful K:BB ratio of 1:03 in 34 big-league outings before shutting it down for Tommy John surgery in June. Taylor was immediately traded for Brett Wallace, who was himself then traded for Anthony Gose, a well-regarded young outfielder who struggled in a short stint with the Blue Jays this season. d’Arnaud, a catcher, has mashed the ball in Triple-A Las Vegas — as practically everyone does — and he, Gose and the 24-year-0ld Drabek could all contribute to the Blue Jays in the future. But to date, they’ve been worth about a negative half-win to the big-league Blue Jays, or seven wins less than Halladay was worth in 2010. Cliff Lee: Traded to the Mariners for three prospects in a flurry of activity around the Halladay acquisition that was often mistaken for a three-way trade, Lee, with one year remaining on his contract, netted the Phillies Minor Leaguers J.C. Ramirez, Phillippe Aumont, and Tyson Gillies. None has reached the Majors*, and none has been ranked in Baseball America’s Top 100 since 2010. Aumont and Ramirez both pitched in relief in Triple-A Lehigh Valley this year, but neither pitched particularly well. Gillies has been pretty good when he has played, but he has missed loads of time stemming from injuries and discipline issues since the trade. Lee was worth 4.8 WAR in 2010. *- UPDATE: Andrew points out on Twitter that Aumont pitched against the Mets this week. He’s got two innings under his belt thus far. Javier Vazquez: Not exactly an ace, I know. But Vazquez had a year left on his contract and was coming off a stellar 2009 campaign when the Braves dealt him and Boone Logan to the Yankees for Melky Cabrera, Mike Dunn and Arodys Vizcaino. This trade’s a bit different from the rest because Cabrera was already a somewhat established Major Leaguer, but he did nothing for his reputation with his play in Atlanta — posting a -0.5 WAR and earning a non-tender after one season. Vazquez was awful for the Yankees, but Logan has been good. Dunn pitched 19 good innings for the Braves then helped them land Dan Uggla. Vizcaino, out for the year after Tommy John surgery, was flipped to the Cubs in the Paul Maholm deal. So despite occasional calls for offseason trades to help the Mets rebuild for the near future, there’s little recent evidence to suggest that trading Dickey — the team’s ace — this winter would pay dividends anytime soon. We are working with an inherently small sample, of course — there are very few ace pitchers and very few of them get traded, so assessing the returns on the handful that do is a fool’s errand. Plus, there’s still some chance the Blue Jays’ haul for Halladay pays off in a pretty big way, since Gose and d’Arnaud could emerge as stars. It just won’t have paid off within three seasons of the trade itself. 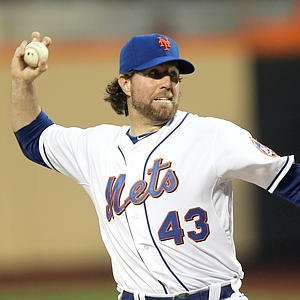 If the Mets do not sign Dickey to an extension or trade him this winter, they could opt to deal him during the season. By that same not-at-all scientific research, I can count three recent examples of aces traded during the season with less than one year of team control remaining on their contracts. CC Sabathia: In early July of 2008, the Indians traded walk-year Sabathia to Milwaukee for Matt LaPorta, Zach Jackson, Rob Bryson and a player to be named later, ultimately Michael Brantley. Sabathia was unreal for the Brewers, often pitching on three days’ rest and amassing 4.7 WAR in half a season. LaPorta and Jackson have been very real for the Indians, combining to be worth -2.1 wins since the trade. Bryson is struggling with his control in Double-A. Only Brantley has turned into a productive player for Cleveland, and he only did so last season. Cliff Lee: No stranger to this blog post, Lee was traded from the Mariners to the Rangers in July, 2010 with capable reliever Mark Lowe for what was then thought to be a massive package of Justin Smoak, Blake Beavan, Josh Lueke, and Matt Lawston. None of those guys is very good. Smoak is hitting like Jason Bay this year. Beavan is in the Mariners’ rotation and can throw strikes but appears to be average at best. Lawston is 26 and in Double-A, and Lueke is bad in multiple ways. The Mariners salvaged the trade package by flipping Lueke for John Jaso, who has randomly been awesome this year. Zack Greinke: This one is definitely too soon to know much about, but this July the Angels traded Ariel Pena, John Hellweg and Jean Segura to Milwaukee for Greinke, who will be a free agent after the season. Pena and Hellweg are both 23-year-old Double-A righties with histories of big strikeout numbers and high walk rates. Segura is a well-regarded 22-year-old infielder who is already playing regularly for the Brewers but probably shouldn’t be. So what’s there to learn? Pretty much nothing — again, this is all small-sample-size stuff. But based on the recent history, combined with the trend across baseball toward valuing prospects and hanging on to young players under team control, it seems like the idea of flipping Dickey for a player or a package of players that could help a contending team in 2014 is probably a pipe-dream. Very few of the young players recently traded for front-line pitchers in the final years of their contracts contributed anything positive to their new teams at all, and basically none did so in the first couple of years after the deal. Just Carlos Gomez, really, and we LOL at Carlos Gomez. If the Mets do not have the means or, for whatever reason, the desire to sign Dickey to an extension this winter, the smart move seems to be starting the season with him in the rotation anyway. Certainly they do not look likely to contend, but writing off any baseball team before a season starts is silly, and the Mets appear way more apt to make a playoff run with Dickey around than without him — obviously. Though with Jon Niese, Johan Santana, Matt Harvey, Dillon Gee, Collin McHugh, Jeurys Familia, Jenrry Mejia, Zack Wheeler and Mike Pelfrey (should the Mets retain him) in the fold, the team should have plenty of starters, none of those guys seems as likely as Dickey to anchor a staff. Perhaps if Sandy Alderson can cobble together an outfield and a bullpen this offseason, the Mets can have a magical everything-falls-right year even despite their financial inflexibility. Again: No one’s saying that’s probable, but trading Dickey before the season is a good way to bail on the possibility before you even give it a shot. And with the prospecting business such a gamble anyway, it doesn’t seem like the Mets are appreciably more likely to get back a future contributor before the season than at the trade deadline if they do fall out of contention. But, of course, it always depends on the deal.